The ruins of a Han dynasty (202 BC – AD 220) Chinese watchtower made of rammed earth in Dunhuang, Province of Gansu, China at the eastern end of the Silk Road. 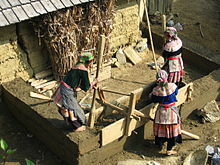 A typical Hmong house-building technique in the subtropical climate of Vietnam. Rammed earth, also known as taipa in Portuguese, tapial or tapia in Spanish, pisé (de terre) in French, and hangtu (Chinese: 夯土; pinyin: hāngtǔ), is a technique for constructing foundations, floors, and walls using natural raw materials such as earth, chalk, lime, or gravel. It is an ancient method that has been revived recently as a sustainable building material used in a technique of natural building. Rammed earth is simple to manufacture, non-combustible, thermally massive, strong, and durable. However, structures such as walls can be laborious to construct of rammed earth without machinery, e. g., powered tampers, and they are susceptible to water damage if inadequately protected or maintained. Edifices formed of rammed earth are on every continent except Antarctica, in a range of environments including temperate, wet, semiarid desert, montane, and tropical regions. The availability of suitable soil and a building design appropriate for local climatic conditions are the factors that favour its use. Manufacturing rammed earth involves compressing a damp mixture of earth that has suitable proportions of sand, gravel, clay, and/or an added stabilizer into an externally supported frame or mold, forming either a solid wall or individual blocks. Historically, additives such as lime or animal blood were used to stabilize it, while modern construction adds lime, cement, or asphalt emulsions. To add variety, some modern builders also add coloured oxides or other materials, e.g. bottles, tires, or pieces of timber. The construction of an entire wall begins with a temporary frame, denominated the "formwork", which is usually made of wood or plywood, as a mold for the desired shape and dimensions of each section of wall. The form must be durable and well braced, and the two opposing faces must be clamped together to prevent bulging or deformation caused by the large compressing forces. Damp material is poured into the formwork to a depth of 10 to 25 cm (4 to 10 in) and then compacted to approximately 50% of its original height. The material is compressed iteratively, in batches or courses, so as to gradually erect the wall up to the top of the formwork. Tamping was historically manual with a long ramming pole, and was very laborious, but modern construction can be made less so by employing pneumatically powered tampers. After a wall is complete, it is sufficiently strong to immediately remove the formwork. This is necessary if a surface texture is to be applied, e.g., by wire brushing, carving, or mold impression, because the walls become too hard to work after approximately one hour. Construction is optimally done in warm weather so that the walls can dry and harden. The compression strength of the rammed earth increases as it cures; some time is necessary for it to dry and as long as two years can be necessary for complete curing. Exposed walls must be sealed to prevent water damage. In modern variations of the technique, rammed-earth walls are constructed on top of conventional footings or a reinforced concrete slab base. Where blocks made of rammed earth are used, they are generally stacked like regular blocks and are bonded together with a thin mud slurry instead of cement. Special machines, usually powered by small engines and often portable, are used to compress the material into blocks. Presently more than 30% of the world's population uses earth as a building material. Rammed earth has been used globally in a wide range of climatic conditions. Rammed-earth housing may resolve homelessness caused by otherwise expensive construction techniques. Detail of the surface of a rammed-earth wall: apart from the patches of damage, the surface shows regular horizontal lines caused by the wooden formwork and subtler horizontal strata from successive courses. The compressive strength of rammed earth is a maximum of 4.3 MPa (620 psi). This is less than that of concrete but more than sufficiently strong for domestic edifices. Indeed, properly constructed rammed earth endures for thousands of years, as many ancient structures that are still standing around the world demonstrate. Rammed earth reinforced with rebar, wood, or bamboo can prevent collapse caused by earthquakes or heavy storms, because unreinforced edifices of rammed earth resist earthquake damage extremely poorly. See 1960 Agadir earthquake for an example of the total destruction which may be inflicted on such structures by an earthquake. Adding cement to soil mixtures poor in clay can also increase the load-bearing capacity of rammed-earth edifices. The United States Department of Agriculture observed in 1925 that rammed-earth structures endure indefinitely and can be constructed for less than two-thirds of the cost of standard frame houses. Soil is a widely available, inexpensive, and sustainable resource. Therefore, construction with rammed earth is very viable. [vague] Unskilled labour can do most of the necessary work. While the cost of rammed earth is low, rammed-earth construction without mechanical tools is very time-consuming and laborious; however, with a mechanical tamper and prefabricated formwork it can require only two or three days to construct the walls of a 200 to 220 m2 (2,200 to 2,400 sq ft) house. One significant benefit of rammed earth is its high thermal mass: like brick or concrete, it can absorb heat during daytime and nocturnally release it. This action moderates daily temperature variations and reduces the need for air conditioning and heating. In colder climates, rammed-earth walls can be insulated with Styrofoam or a similar insert. It must also be protected from heavy rain and insulated with vapour barriers. Rammed earth can effectively regulate humidity if unclad walls containing clay are exposed to an internal space. Humidity is regulated between 40% and 60%, which is the ideal range for asthma sufferers (https://www.nationalasthma.org.au/news/2016/indoor-humidity) and for the storage of susceptible objects such as books. The material mass and clay content of rammed earth allows an edifice to breathe more than concrete edifices, which avoids problems of condensation but prevents significant loss of heat. Untouched, rammed-earth walls have the colour and texture of natural earth. Moisture-impermeable finishes, such as cement render, are avoided because they impair the ability of a wall to desorb moisture, which quality is necessary to preserve its strength. Well-cured walls accept nails and screws easily, and can be effectively patched with the same material used to build them. Blemishes can be repaired using the soil mixture as a plaster and sanded smooth. The thickness, typically 30 to 35 centimetres (12 to 14 in), and density of rammed-earth walls make them suitable for soundproofing. They are also inherently fireproof, resistant to termite damage, and non-toxic. Edifices of rammed earth are thought[by whom?] to be more sustainable and environmentally friendly than popular techniques of construction. Because rammed-earth edifices use locally available materials, they usually have low embodied energy and generate very little waste. The soils used are typically subsoils low in clay, between 5% and 15%, which conserve the topsoil for agriculture. When the soil excavated in preparation for a foundation can be used, the cost and energy consumption of transportation are minimal. Rammed earth is probably the least environmentally detrimental construction material and technique that is readily and commercially available today to construct solid masonry edifices. Rammed earth has potentially low manufacturing impact, contingent on the amount of cement and the amount that is locally sourced; it is often quarried aggregates rather than "earth". Formwork is removable and can be reused, reducing the need for lumber. Mixing cement with the soil can counteract sustainable benefits such as low embodied energy and humidity regulation because manufacture of the cement itself adds to the global carbon dioxide burden at a rate of 1.25 tonnes per tonne of cement produced. Partial substitution of cement with alternatives such as ground granulated blast furnace slag has not been demonstrated to be effective, and implicates other questions of sustainability. Rammed earth can contribute to the overall energy efficiency of edifices: the density, thickness, and thermal conductivity of rammed earth render it an especially suitable material for passive solar heating. Warmth requires almost 12 hours to be conducted through a wall 35 cm (14 in) thick. Rammed-earth construction may also reduce the ecological impacts of deforestation and the toxicity of artificial materials associated with conventional construction techniques. Although it has low greenhouse emissions in theory, transportation and the production of cement can add significantly to the overall emissions of modern rammed earth construction. The most basic kind of traditional rammed earth has very low greenhouse gas emissions but the more engineered and processed variant of rammed earth has the potential for significant emissions. Evidence of ancient use of rammed earth has been found in Neolithic archaeological sites of the Yangshao and Longshan cultures along the Yellow River in China, dating to 5000 BCE. By 2000 BCE, rammed-earth architectural techniques (夯土 Hāng tǔ) were commonly used for walls and foundations in China. In the 1800s, rammed earth was popularized in the United States by the book Rural Economy by S. W. Johnson. The technique was used to construct the Borough House Plantation and the Church of the Holy Cross in Stateburg, South Carolina, both being National Historic Landmarks. An outstanding example of a rammed-earth edifice in Canada is St. Thomas Anglican Church in Shanty Bay, Ontario, erected between 1838 and 1841. Edifices of the Borough House Plantation, Stateburg, South Carolina, erected in the 1820s. From the 1920s through the 1940s rammed-earth construction in the US was studied. South Dakota State College extensively researched and constructed almost one hundred weathering walls of rammed earth. For over 30 years the college investigated the use of paints and plasters in relation to colloids in soil. In 1945, Clemson Agricultural College of South Carolina published the results of their research of rammed earth in a pamphlet titled "Rammed Earth Building Construction". In 1936, on a homestead near Gardendale, Alabama, the United States Department of Agriculture constructed an experimental community of rammed-earth edifices with architect Thomas Hibben. The houses were inexpensively constructed and were sold to the public along with sufficient land for gardens and small plots for livestock. The project successfully provided valuable homes to low-income families. The US Agency for International Development is working with undeveloped countries to improve the engineering of rammed-earth houses. It also financed the authorship of the Handbook of Rammed Earth by Texas A&M University and the Texas Transportation Institute. The Handbook was unavailable for purchase by the public until the Rammed Earth Institute International gained permission to reprint it. Interest in rammed earth declined after World War II when the cost of modern construction materials decreased. Rammed earth was considered substandard, and still is opposed by many contractors, engineers, and tradesmen who are unfamiliar with earthen construction techniques. The prevailing perception that such materials and techniques perform poorly in regions prone to earthquakes has prevented their use in much of the world. In Chile, for example, rammed earth edifices normally cannot be conventionally insured against damage or even be approved by the government. A notable example of 21st century use of rammed earth is the façade of the Nk'Mip Desert Cultural Centre in southern British Columbia, Canada. As of 2014 it is the largest rammed earth wall in North America. "Pisé" houses of rammed earth in Tabant, Morocco; the technique is denominated "tabut" there. Wikimedia Commons has media related to Rammed earth. ^ Fleming, John; Honour, Hugh; Pevsner, Nikolaus (1966). The Penguin Dictionary of Architecture. drawings by David Etherton (1st ed.). London, England, UK and New York, New York, USA: Penguin Books. ISBN 978-0-14-051241-0. OCLC 638962596. ^ "Pisé terminology". Merriam-webster.com. Retrieved 2018-10-03. ^ Keable, Rowland. "Rammed Earth Lecture Theatre, CAT". Rammed Earth Consulting. London, England, UK. Retrieved February 4, 2012. ^ a b c d e f g h i Cassell, Robert O. (17 December 2001). "A Traditional Research Paper: Rammed Earth Construction". Ashland Community and Technical College. Retrieved 4 February 2012. ^ a b "BENEFITS OF BUILDING IN RAMMED EARTH". Rammed Earth Constructions. Maleny, Australia: Rammed Earth Constructions P/L. Retrieved 4 February 2012. ^ Betts, Morris Cotgrave; Miller, Thomas Arrington Huntington (May 1937) . "Farmers' Bulletin No. 1500: Rammed Earth Walls for Buildings - Rammed Earth Books - The Boden Hauser". The Boden Hauser. p. 20. OCLC 600507592. Archived from the original on February 25, 2012. Retrieved February 4, 2012. Originally published by the United States Department of Agriculture, Washington, DC, USA. An alternative version is at: Betts, Morris Cotgrave; Miller, Thomas Arrington Huntington (May 1937) . Rammed Earth Walls for Buildings. Denton, TX, USA: UNT Digital Library, University of North Texas. OCLC 600507592. Retrieved 4 February 2012. ^ a b "Soils for Rammed Earth, Caliche Block, and Soil Material Construction". Austin, TX, USA: Sustainable Sources. Retrieved 4 February 2012. ^ "Rammed Earth Construction". Earth Structures. Victoria, Australia. Retrieved 4 February 2012. ^ Nelson, Wayne (21 May 2003). "Natural Building Colloquium: Compressed Earth Blocks". NetWorks Productions. Retrieved 4 February 2012. ^ Keable, Rowland. "Rammed Earth – Pollution and Cement". Rammed Earth Consulting. London, England, UK. Retrieved 4 February 2012. ^ "Ground Granulated Blast-Furnace Slag". Washington, DC, USA: Federal Highway Administration. 7 April 2011. Archived from the original on 22 January 2007. Retrieved 4 February 2012. ^ Xujie, Liu; et al. (2002). Steinhardt, Nancy Shatzman (ed.). Chinese Architecture. New Haven, CT, USA: Yale University Press and Beijing, China: New World Press. pp. 12–14, 21–2. ISBN 978-0-300-09559-3. OCLC 186413872. ^ "National Register Properties in South Carolina: Borough House Plantation, Sumter County (SC Hwy 261, vicinity of Stateburg)". National Register Sites in South Carolina. Columbia, SC, USA: South Carolina Department of Archives and History. 20 April 2009. Retrieved 4 February 2012. ^ "National Register Properties in South Carolina: Church of the Holy Cross, Sumter County (SC Hwy 261, Stateburg vicinity)". National Register Sites in South Carolina. Columbia, South Carolina, USA: South Carolina Department of Archives and History. April 20, 2009. Retrieved February 4, 2012. ^ Wolfskill, Lyle A.; Dunlap, Wayne A.; Gallaway, Bob M. "Handbook For Building Homes of Earth" (PDF). Texas Transportation Institute bulletin (21) (1453 ed.). College Station, Texas, USA: Texas Transportation Institute. Retrieved October 6, 2017. "Earth to Saltspring". Western Living. Vancouver, British Columbia, Canada: Western Living. 23 (10). October 2003. ISSN 0824-0604. OCLC 20108901.